‘Max worried. A lot.’ So begins this charming tale about a little boy and his incessant thoughts. His concerns range from the real to the improbable, but all are highly relatable for the book’s young target market. From people not liking him to being abducted by aliens, Max feels overwhelmed by his worries, yet is too afraid to tell anyone. Enter Bob, Max’s adorable dog with a calming effect. Max feels free to open up to Bob, and in a highly creative way his worries are dealt with. 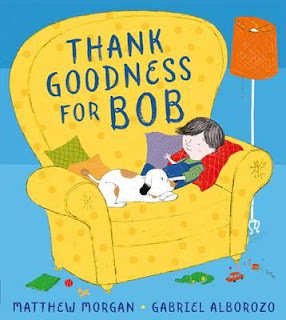 Thank Goodness for Bob is about helping children deal with their concerns, and about not dismissing any of them as ridiculous. Empathy, communication and creative solutions are all themes of the story, which manages to deal with eliminating fears in a non-didactic, and at times, highly fun and engaging way. Charming illustrations by Gabriel Alborozo (of The Colour Thief fame) feel just right.